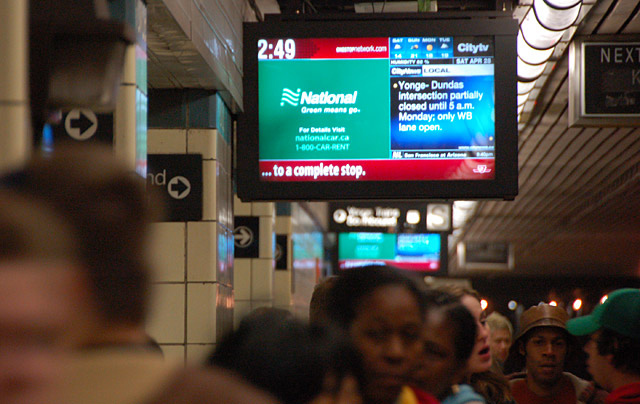 A source at City Hall recently warned that the ONESTOP Media Group, which operates the advertising screens on TTC station platforms, will soon make another play to put video ads inside subway cars (the Toronto Public Space Committee successfully warded off their last attempt). The new cars the TTC has ordered will have video displays, anyway (see after the jump), but as of yet there are no plans for them to be used for advertising. While we of course do not begrudge the CONTACT festival for partnering with ONESTOP, we are dismayed that a company that once packed a TPSC meeting with its own staffers and their family members (in an attempt to vote the TPSC’s campaign against the video screens out of existence), would keep trying to pass itself off as attuned to the needs and desires of the people of this city. A company that makes the only really important information (the time) impossible to see in order to make room for prominent advertising and to draw people close enough to the screens in order to clearly see that advertising. A company that now has exclusive rights to install clocks on platforms but refuses to do so in stations at which there wouldn’t be enough eyeballs for their ads (think Rosedale). A company that hired Mike Harris, the man who crippled the TTC, as the Chair of their advertising firm. And now they want to be our latex salesman a friend of the photoblogging community. He said that there are different ways to measure size and that that wasn’t necessarily true. They talked/discussed/argued for half an hour, and he gave the TPSC his email address if they had any more questions. About a month later, they did have more questions, and so they sent him an email. And then another one. In one of those emails, the TPSC asked Girgis to clarify what was meant by “motion detection” capability in the context of the “information pillars” in CBS’s “street furniture” proposal; the video programming for which would have been provided by ONESTOP. That is, their proposal included a plan to put at least one hundred and twenty illuminated video ad kiosks on Toronto’s sidewalks, which would have apparently activated when people walked within a certain distance of them; ONESTOP is quite upfront about their goal to make sure that there isn’t a single moment in a day when you are not confronted with a video ad. So is this really a company to which you want to grant “the right to print, publish, broadcast, and use [your photos] in any manner [they] deem appropriate worldwide, in any media now known or hereafter developed, including, without limitation, the World Wide Web, at any time or times in relation to the Contact project”? Jonathan Goldsbie is a campaigner with the Toronto Public Space Committee. Photo by Torontoist’s Marc Lostracco. 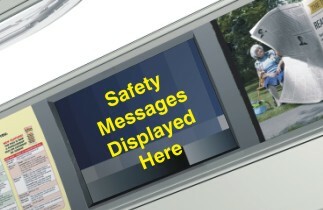 Rendering of “Safety Information Monitor” in new trains from the TTC website.